Beginning February 1st, the PAWS-Chicago spay/neuter clinic will begin tattooing all spay/neuter patients it performs surgery on. "To meet the standards set by The Association of Shelter Veterinarian, your pet will receive a tattoo at the time of their spay/neuter surgery. The green tattoo is a permanent mark that notifies all future veterinarians and shelter personnel that this patient has already had its spay/neuter surgery. 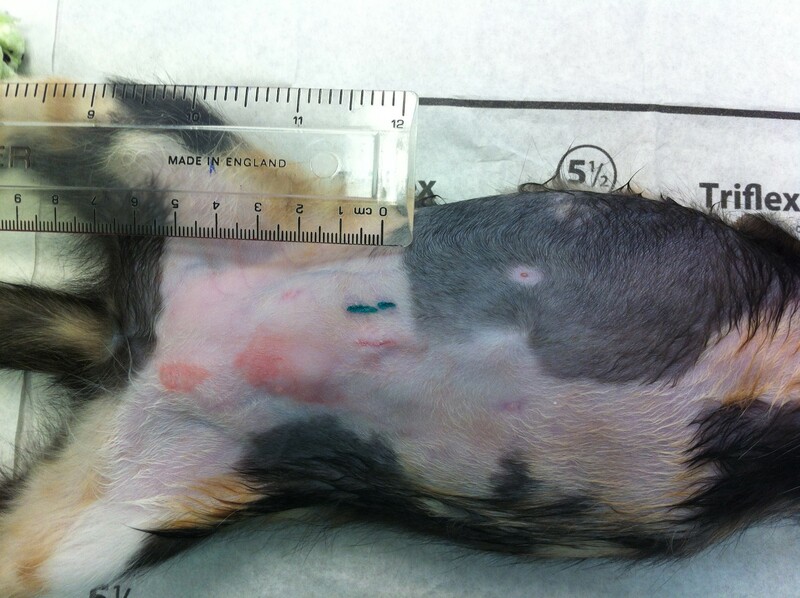 Many spay/neuter surgical scars can be very small especially if the surgery was done as a puppy or kitten. Tattooing at the time of spay/neuter surgery avoids the possibility of a tattooed animal from undergoing unnecessary exploratory surgery in the future. The ink is specially designed to be used for tattooing and does not increase the risk for infection. The ink is also not harmful if licked. The tattoos will be permanent. Please do not rub or wash the tattoos for the next 2 weeks. For all dogs the tattoo will be 2 small green lines next to the surgical incision. For cats the tattoo will be 2 small green lines on the underside of the abdomen (belly). Feral cats will have the left ear tipped (a small portion of ear tip removed) and will also be tattooed on the underside of the abdomen. Sometimes ear tips can be confused with frostbite or fight wounds. With the green tattoo on the belly there will be no doubt that the spay/neuter surgery has already been done and thus avoid any unnecessary exploratory surgery in the future." As PAWS is the place where we take 99.99% of all of our cats to be spayed/neutered, the number of cats in and around DuPage County with these protective tattoos will be rapidly increasing. The picture thumbnail is of a spayed cat with the green-ink tattoo. Click on it to see a larger version of the picture.